In this audiobook, Dr. Wanis will give you the keys to finding love and happiness once again. Australian Patrick Wanis, PhD, is a renowned life coach, human behavior and relationship expert, clinical hypnotherapist, and author with extensive credits worldwide. Much of his work has focused on examining the role of the mind, body, and physiology on behavior and psychological functioning. Wanis holds a PhD in health psychology from the Open International University for Alternative Medicine. 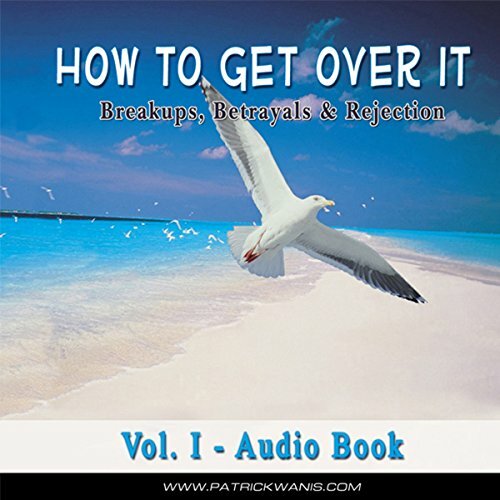 I really like Patrick Wanis and I feel this audio has very good information with moving past things once a relationship closes. However the one thing I do not like about this is the woman doing the interview. "Honeybee." She seems hung up on the thought of someone not being "Worthy of you." Every time Wanis tries to direct her away from that line of thinking, she clings to it with such dedication he eventually just gives up. I feel the same info just with Wanis giving it would be much more benifical without the distracting side comments from "Honeybee." What would have made How to Get Over It better? Very little substance. Man and woman talking to one another in an question/answer style. I got absolutely nothing new or helpful from this. Would you ever listen to anything by Patrick Wanis again? If you could play editor, what scene or scenes would you have cut from How to Get Over It? Id scrap the whole book. You May get over it, but not with this book. What disappointed you about How to Get Over It? I am over it, thankfully! However, if I was desperate and really needed some help, this book would not be answer. I've purchased apx 136 books and this is the first book I have returned. What could Patrick Wanis have done to make this a more enjoyable book for you? Not cover so many topics/subjects simultaneously. The introduction reminded me of the many hard sell commercials that promise you the world then quite to my dissapointed the real brilliance is only in the hard sell at the beginning. Love audible. Everyone does a super job, people are educated, capable and eager to help the customer. Truly you rank very high in customer satisfaction. Would you try another book from Patrick Wanis and/or Patrick Wanis? Would you be willing to try another one of Patrick Wanis’s performances? The whole thing complete waste of money. The "book" is clearly the first chapter and frankly it was pretty average. What a bunch of puffed up crap this book was. NOTHING of use. Listen to It's Called a Breakup because it is Broken, and leave this scammy waste of time alone. Would recommend for anyone in pain !!!!!!!!!!!!!! Would you consider the audio edition of How to Get Over It to be better than the print version? You have to listen with an open heart and mind. When you listen to the details, and really process the ideas, Dr. Wanis is amazing and wonderful. This helped me answer so many questions I had. Thank-you!! What did you love best about How to Get Over It? I found this book so amazingly simple and straight forward. The methods and exercises are really good.I love this book! I absolutely loved this book!!!! Practical and down to earth, straight to the point advise! Patrick Wanis is a great author! it talks about why you fall in love which makes you think about your relationship, that doesnt help.